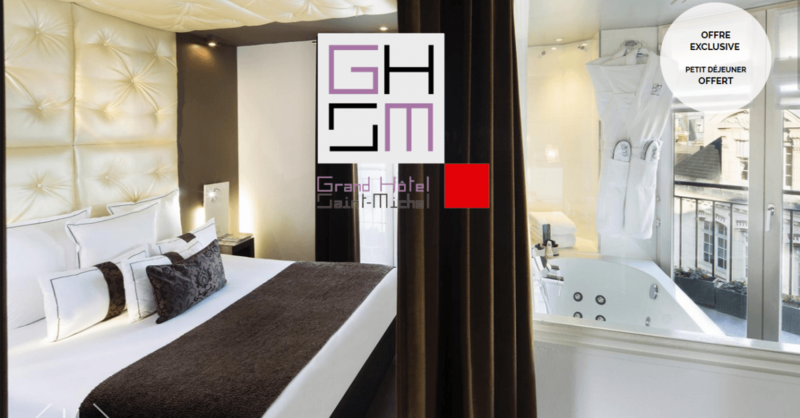 Whether you are in Paris for a holiday, a business trip or a romantic getaway, the Grand Hotel Saint Michel offers an ideal and convenient central location in the charming Latin Quarter, surrounded by restaurants, designer workshops, fashion shops, antique dealers and bookstores. The hotel is close to public transportation - Metro, bus, RER - which allow you to move easily within the City of Light, reach the train stations and airports quickly and, in just a few minutes, get to the Louvre, the Pompidou Centre, the Orsay Museum, the Eiffel Tower, the capital’s renowned department stores and the Avenue des Champs-Elysées. Here you can stay right in the heart of Paris, close to the Sorbonne, the Jussieu Campus, the Collège de France and the Lycée Henri IV public secondary school, but also just a short stroll from the Seine, its iconic quays and Notre-Dame Cathedral, the literary district of Saint-Germain-des-Prés and many attractions such as the Pantheon, the picturesque Place de la Contrescarpe, the Jardin du Luxembourg and the Senate, the Cluny Museum, the Jardin des Plantes and its menagerie, the National Museum of Natural History and the Arenas de Lutece, a well-preserved Gallo-Roman amphitheatre. From Roissy-Charles-de-Gaulle Airport, direct access (45 minutes): direct access is available via the RER B, heading towards Saint-Rémy-lès-Chevreuse. Get off at Luxembourg station, take exit no. 2 Gay-Lussac or Jardin du Luxembourg, go up the escalator and walk down the Boulevard Saint-Michel to no. 53, then take the first street on your right: we are located at 19 Rue Cujas. 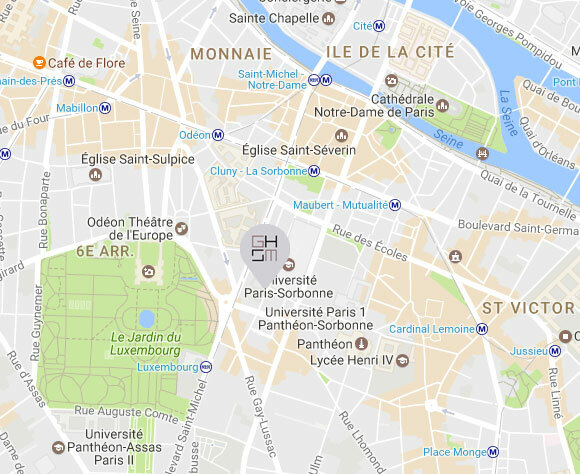 From Orly Airport, direct access (30 minutes): take the Orlyval shuttle to Antony station, then RER B from Antony in the direction of Mitry-Claye or Charles de Gaulle airport. Get off at Luxembourg station, take exit no. 2 Gay-Lussac or Jardin du Luxembourg, go up the escalator and walk down the Boulevard Saint-Michel to no. 53, then take the first street on your right: we are located at 19 Rue Cujas. From the Gare de Lyon (15 minutes): take the RER A (in the direction of Cergy-le-Haut, Poissy or Saint-Germain-en-Laye) to Châtelet-les Halles station, then the RER B (in the direction of Rémy-lès-Chevreuse) to Luxembourg station. Take exit no. 2 Gay-Lussac or Jardin du Luxembourg, go up the escalator and walk down the Boulevard Saint-Michel to no. 53, then take the first street on your right: we are located at 19 Rue Cujas. From the Gare du Nord (10 minutes): direct access is available via the RER B (in the direction of Saint-Rémy-lès-Chevreuse) to Luxembourg station. Take exit no. 2 Gay-Lussac or Jardin du Luxembourg, go up the escalator and walk down the Boulevard Saint-Michel to no. 53, then take the first street on your right: we are located at 19 Rue Cujas. From the Gare de l'Est (15 minutes): take Metro line 4 (in the direction of Porte de Clignancourt) to Gare du Nord station, then the RER B (in the direction of Saint-Rémy-lès-Chevreuse) to Luxembourg station. Take exit no. 2 Gay-Lussac or Jardin du Luxembourg, go up the escalator and walk down the Boulevard Saint-Michel to no. 53, then take the first street on your right: we are located at 19 Rue Cujas. From the Gare Montparnasse (15 minutes): take Metro line 4 (in the direction of Mairie de Montrouge) to Denfert-Rochereau station, then the RER B towards Mitry-Claye or Charles de Gaulle Airport. Get off at Luxembourg station, take exit no. 2 Gay-Lussac or Jardin du Luxembourg, go up the escalator and walk down the Boulevard Saint-Michel to no. 53, then take the first street on your right: we are located at 19 Rue Cujas. From the Gare Saint-Lazare (25 minutes): take Metro line 14 (in the direction of Olympiades) to Châtelet-les-Halles station, then the RER B (in the direction of Saint-Rémy-lès-Chevreuse) to Luxembourg station. Take exit no. 2 Gay-Lussac or Jardin du Luxembourg, go up the escalator and walk down the Boulevard Saint-Michel to no. 53, then take the first street on your right: we are located at 19 Rue Cujas. Metro: from Cluny-La Sorbonne station (line 10), exit onto the Boulevard Saint-Michel. Go up the Boulevard Saint-Michel to no. 53, then take the first street on your right: we are located at 19 Rue Cujas. RER: from Luxembourg station (line B), take exit no. 2 Gay-Lussac or Jardin du Luxembourg, go up the escalator and walk down the Boulevard Saint-Michel to no. 53, then take the first street on your right: we are located at 19 Rue Cujas.